River Class students enjoyed a S'math lesson taken from AIMS Education Foundation and led by our shared resource teacher, Joan. 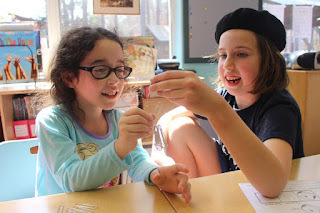 Students compared the magnetic strength of a single magnet with two magnets put together to make a single unit. Students worked in cooperative learning groups to complete the exercise. Students were asked to estimate and then record their results. 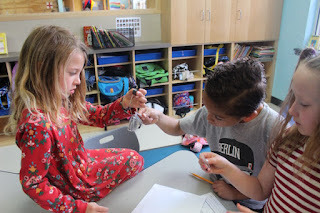 Students discovered that a magnet made up of two single units is indeed stronger than a single magnet but not as strong as the combined strength of two magnets tested separately.